HSE has published a new, simplified version of the Health and Safety Law Poster. It tells workers what they and their employers need to do in simple terms, using numbered lists of basic points. 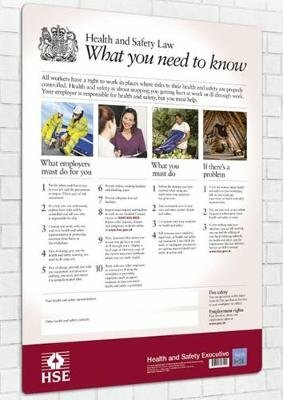 As an employer, you are required by law to either display the HSE-approved poster or to provide each of your workers with the quivalent 'leaflet'. The leaflet version of the poster has now been replaced by a pocket card, which is more durable and better suited to the workplace. (ISBN 9780717663507 in packs of 25.) The law has been changed - for the new poster you don't have to add contact details of your enforcing authority and HSE's Employment Medical Advisory Service. You can add details of any employee safety representatives or other health and safety contacts, but this is not compulsory.